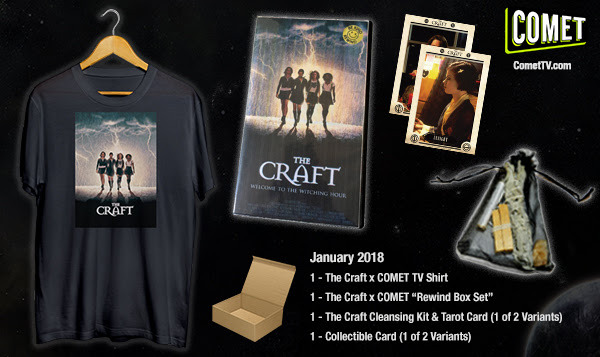 1 - Limited Edition The Craft COMET TV T-shirt: This The Craft exclusive T-Shirt features all four witchy guardians of the watchtower on the front and a quote from the film on the back! Welcome to the Witching Hour! To Enter Just Comment Below what you're most looking forward to seeing this month on COMET TV. January will mark the second anniversary of the day we lost pop culture legend David Bowie, so this month’s COMET is honoring his memory in the best way we coul think of .... by screening one of the most iconic roles of his career. Back in 1986, Bowie stole the show as the Goblin King in Jim Henson’s Labyrinth, from the music to the costumes, this was Bowie at his best.